Many introductory Corporate Finance textbooks tout their engaging, real-world examples, but they often fail to hold students' interest. 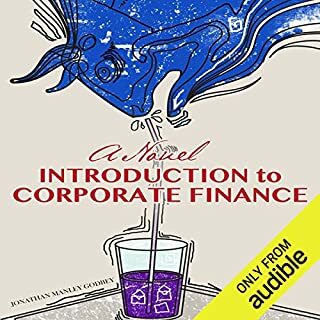 A Novel Introduction to Corporate Finance offers a unique, innovative, and refreshing contrast. Structured as a work of literary fiction, the book successfully uses a compelling narrative to tell the “story” of corporate finance. Are study sets available for audible listeners? Only useful if you have the physical book. Would you try another book from Jonathan Manley Godbey and Jason Mehl and/or David Baker? Absolutely, just not in an audio book format. 2. Any female character regardless of age, or any male character age 25 or younger. It actually made it fairly difficult to keep track of the characters. The audiobook is useless without any sort of visual companion for the charts, formulas, and and "homework" sections. Instead, the performer reads all of these sections, and if you're at the level for which this publication was intended and exclusively relying on the audiobook, I can't imagine actually grasping the topics being illustrated.